South America is home to most of the Jaguars. The have a considerable range here that they cover. On one end they are found in Mexico and at the other Brazil. Everywhere in between there can have them residing. Many people are interested in the fact that Argentina is also home to some Jaguars. While they used to be very populated in areas of the United States they only region where they continue today is throughout remote locations in Arizona. It is believed that heavy hunting in the USA of the Jaguar resulted in them being wiped out in the very early 1900’s. 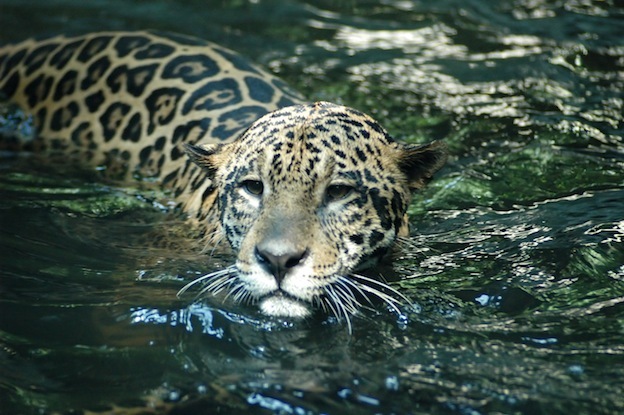 Most of the Jaguars prefer to live in the dense areas of the rainforest. However, they also are known to live out on the open terrain. The fact that their natural habitat continues to be taken away by humans is a reason for this as well. The Jaguar is very adaptable and it will move where it can find food so that it can survive. They enjoy swimming in bodies of water and will do so to help cool off. There are times when they use the water for capturing prey too. They can chase their meal into the water. The home range of a male Jaguar can be up to 55 square miles. The females usually have about half of that. It is common for many females to overlap with the territory of the male. They usually just avoid being in the same place at the same time. If they are in the same area it is the female that will continue on as the male is dominant. They may remain in the same place though if she is ready to mate. What is very interesting is that the Jaguar is very active compared to other felines. They may move around up to 60% of their time. Most felines are nocturnal meaning they are only active at night. For the Jaguar though they can be found moving around just as often during the day as at night. Some experts believe this is a method that allows them to be able to find prey during hours when other felines and predators won’t be active. Thus they have a better chance of being able to continually get the amount of food they need for survival. One of the biggest threats to the Jaguar for its future though has to do with the habitat. It continues to get smaller due to humans using it for forestry or agriculture. The development of homes and businesses in many areas where these animals are usually about to roam without being disrupted has stirred up many issues. The use of pesticides and herbicides in agricultural regions where these animals live have created issues. These are types of poison and they can result in animals becoming very ill. Some of them can end up being sterile due to such exposure or losing their sight. Death can also occur due to the way in which the poison affects the central nervous system. They are adaptable creatures and they will continue to move where they must in order to survival. If that means changing their habitat to areas where there are humans they will do so. This particular feline has no reservations about humans and will attack them. Many of the conservation efforts out there focus on helping to protect the amount of habitat that these animals have left. They feel it is a key method that has to be incorporated to keep the number of Jaguars from decreasing.